Google My Business is a great way to structure the information consumers see when searching for your business online. You can share information such as your location, hours of operation, and even allow them to place a call. We know from recent studies that consumers prefer messaging rather than calling businesses. With messaging, businesses can handle a significantly higher volume of inbound requests rather than staffing to handle phone calls. 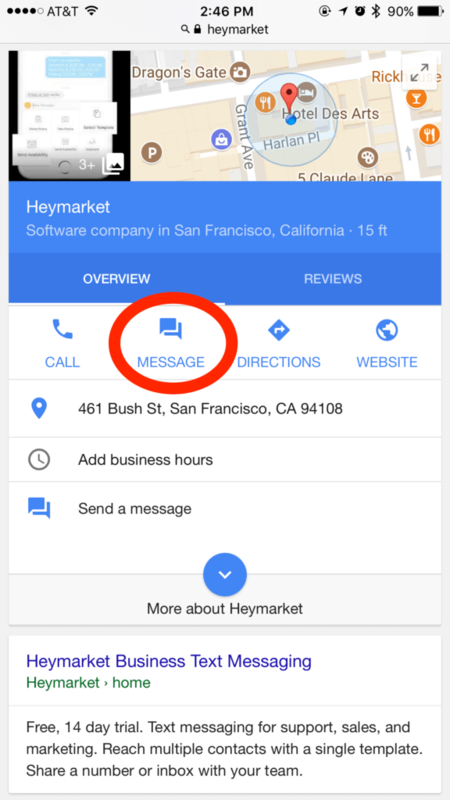 Heymarket can enable your business to not only receive text messages from your Google My Business listing, but also share and manage those messages with your team. With just a few steps, you can update Google My Business to have a ‘Message’ button. When someone taps it on their mobile phone, it will launch their SMS app with a pre-defined message. The message will be delivered to your Heymarket shared inbox, where anyone on your team can read the message and reply. You’ll also get features to manage incoming messages: assignments, templates, auto replies, do not disturb, and more. Heymarket can also text enabled your existing business number while keeping the voice service intact. This works with any landline or toll-free number. It’s a great way to provide a single number for your customers to either text or call you. Setup you Google My Business listing today to accept text messages and watch the leads come in.